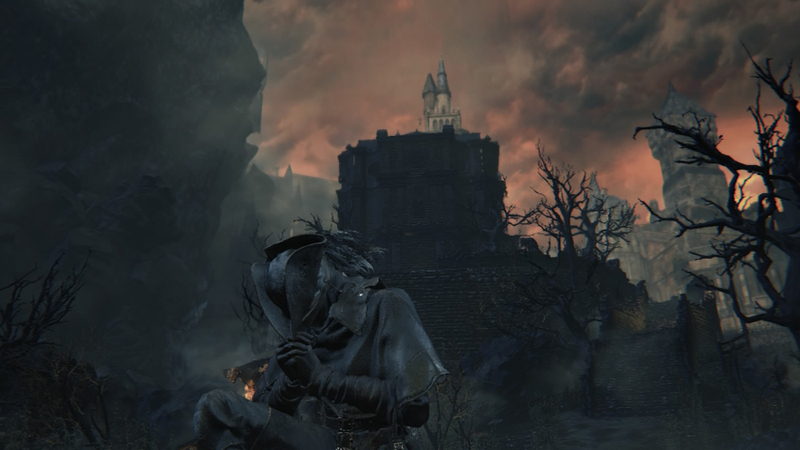 Bloodborne’s next challenge is the Shadow of Yharnam which – spoilers! – isn’t a literal shadow. Bloodborne players who successfully defeat the Shadow of Yharnam boss will receive the Blood Rapture, which may or may not seem worth it after you’ve tried this a few times. The complicating factor in this battle is that the Shadow is actually three Dark Clerics. They all have different attacks. One shoots fireballs, usually three at once in a triangle directly in front, but sometimes one, right ahead. The next one has a sword, which isn’t too worrying, and the last one has a sword and a candle and casts fire based magic spells. None of these three on their own are particularly difficult to evade, especially if you stay locked onto the one with the projectiles. Unfortunately, every time you kill one, the other two get more powerful, and by the time you’re down to one that lone survivor is very difficult indeed. There are two approaches to counter this: you can whack them all down to almost no health and then try to kill them all quickly (recommended), or you can decide which one you find most dangerous and take it out first, leaving the easiest one for last. For most players, this will mean killing the magic user, the fire guy, and then the swordbearer. The swordbearer does summon giant snakes though, so, you know – watch out for that. In terms of moment to moment tactics, basically just keep on movin’ movin’ and give them a whack whenever one passes close enough to you while you have a bit of stamina handy to do a proper combo. It’s best to keep moving and not risk it if you don’t have enough to go around; you don’t want to get caught out, unable to dodge. Happily, the clerics will stagger with almost every hit, so you can use a nice fast weapon and get out of there in a hurry before the other two come for you. When you’ve won, light the Forbidden Grave Lantern – but don’t stop there, because there’s another lantern really close by. Go through the door and down the path, and watch for an ambush when you pass the brick wall on the right. A Tree Mutant will attack, but it’s not much of a threat. Keep going, grab the Madman’s Knowledge on the left, and then trot on to the Byrgenwerth Lantern. This is our next destination.